Now I know what you're thinking? Would Vader drive an automatic or a manual? Sucker - he's a member of the Sith! If Luke Skywalker can lift a rock from a swampy bog with his mind and a one-man geriatric goblin-like cheerleading team, Darth Vader could easily use his mind powers to drive this beastie round the burbs. Built at full size and displayed at this year's Comic Con by Hot Wheels, to promote the upcoming miniature $40 version (what?! $40 is almost enough for a REAL car! ), the 526 horsepower engine even sounds like Vader's infamous and deadly breath! 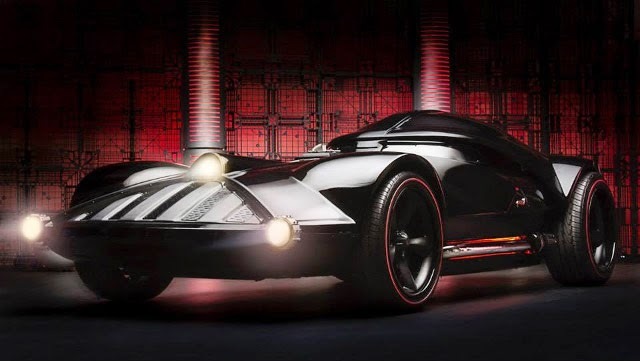 A mean grill that would send Jedi's flying, a Corvette chassis and lightsaber chrome exhaust pipes are just two features of this literally wicked ride, infact the only downside it has, is there is no Jaja Binks wrapped around it's tires. Though that's never out of the question. To see all the light-up bits and pop up pieces this car has (as well as to hear that meaty engine sound) click play below.